On June 9, 2009, at the 2009 Guangzhou International Lighting Exhibition, Aladdin Lighting Network had the opportunity to interview Mr. Wu Yulin, the general manager of Foshan Kaixiou Lighting. I gained a deeper understanding of the development and market positioning of Kaixiou Lighting in Foshan City, and also for the first time learned the concept of lighting lighting. Foshan Kaixiou Lighting to create lighting mood lighting Aladdin Lighting Network: Mr. Wu, Hello! I am very glad that you can accept our interview, please tell us about your plan to participate in the international lighting exhibition and harvest? Mr. Wu: In 2010, Kaisio Lighting created the mood lighting for lighting. The mood lighting of the family has gradually highlighted the demand in the world, but few people have actually realized it. Through the 2009 Guangzhou International Lighting Exhibition, Kaixiou Lighting hopes to clarify our positioning and publicize our research and development in the industry. At the same time, we hope to promote the design of the whole company to a higher level through the on-site learning of the exhibition. Aladdin Lighting Network: What are the main products and concepts of your company? Mr. Wu: The main thing we showed this time is the energy-saving lamps for LEDs. The highlight of this is our own new design. Kasio Lighting has applied for more than 80 patents in design, fully demonstrating the characteristics of LED light sources, making it widely used in many aspects such as home and entertainment venues. The concept of Kaixiou Lighting is to make LED products and lamps reach thousands of households and make the market bigger and stronger. Classical Crystal Chandelier is retro and classical style chandelier. The main materials usually have metal and different top crystals. These style always has a sense of hierarchy, full of rationalism. 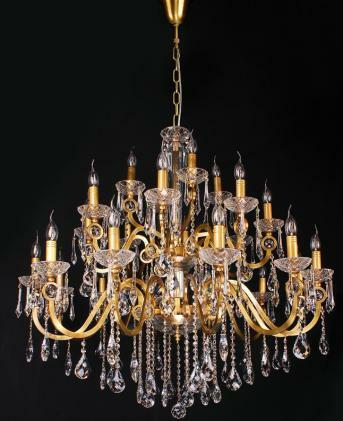 The big size of classical Crystal Chandelier are much applied to luxury house, like vintage, villa , church and so on.